In 1886 at the age of 17, Clifford K. Berryman moved from Kentucky to Washington, DC, to work at the U.S. Patent Office, where he used his self-taught talents to draw patent illustrations. He left the Patent Office in 1891 to become a cartoonist’s understudy for the Washington Post. Within five years, Berryman was chief cartoonist, a position he held until 1907 when he became the front-page cartoonist at the Washington Evening Star. Berryman drew political cartoons for the Star until his death in 1949 at the age of 80. 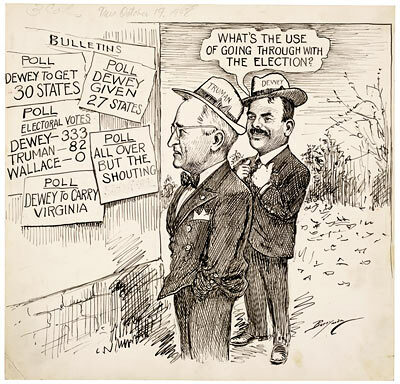 Washington political circles embraced Berryman’s cartooning. Throughout his extraordinary career, he drew every Presidential administration from Grover Cleveland to Harry Truman. He satirized both Democratic and Republican political figures but never used outlandish caricature, which won him great respect from many politicians. With brilliantly simple pen strokes, Berryman created exacting portraiture that was both flattering and true to his subjects. Throwing Your Hat in the Ring! All the cartoons & images in this exhibit can be saved & printed. Plus, get the bonus desktop backgrounds! Visit the Live Exhibit in Washington DC — February 8th to August 17th, 2008! See Berryman’s original, large-format drawings and much more at the Lawrence F. O’Brien Gallery inside the National Archives Building in Washington DC. Available from the National Archives Shop, order the “Running for Office” book!